A color circle, based on the primary colors of red, yellow, and blue, is traditional in all forms of art, including makeup artistry. The primary colors of the color circle cannot be mixed or formed by any combination of any other colors; conversely, all other colors are derived from these three colors, or hues (a color in its purest form). Why Do Makeup Artists Study Color Theory? •The temperature and color of the undertone of the skin need to be determined in order to choose the correct foundation. The visible spectrum of light, as seen by the human eye, was first imprinted on a “color wheel”, first created in 1666 by Sir Isaac Newton. Several variations of the color wheel have been made since then, but the theory behind the color wheel remains the same; there are three primary colors, three secondary colors and six tertiary colors. 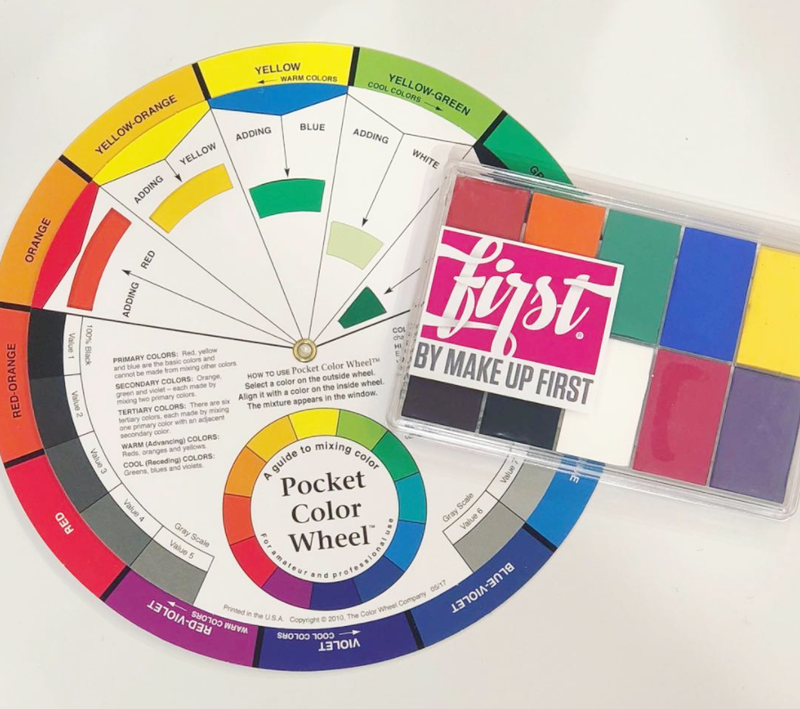 The colors on the outside of the color wheel are pure hues; you can alter these colors by tinting (adding white), shading (adding black) to the color, and toning (adding shades of grey). The Color Wheel is divided into a warm and a cool side. Red is a warm primary color; however, when tined, red becomes cool. Green, a secondary color, can be either warm or cool. All other colors on the pigmented color wheel are either warm or cool. Primary colors: Red, Yellow, and Blue. These colors cannot be created by mixing other colors. Secondary colors: created by mixing an equal amount of two primary colors. –Red and Blue create Violet (or Purple). –Red and Yellow create Orange. –Blue and Yellow create Green. Tertiary colors: created by mixing a primary color with a secondary color. –Red and Orange create Red-Orange. –Red and Violet create Red-Violet. –Blue and Green create Blue-Green. –Blue and Violet create Blue-Violet. –Yellow and Green create Yellow-Green. –Yellow and Orange create Yellow-Orange. •True colors are either warm or cool. •One half of the color wheel is warm; the other is cool. •The value of a color is measured by how much black, white or grey, has been added to a color. •White is added to create a tint. •Use black sparingly; it can quickly “muddy” the color. Grey is added to create a tone. (more subtle coloration). A color may also be “toned down” by adding its complementary color in various increments. •Foundation selection is based on the undertone: warm foundations work with warm undertones; the same is true for cool undertones and cool foundation. •Foundation must be selected according to value; light to dark. •With the lightest and darkest skin tones, the greater the margin is for error: lines of demarcation will be more apparent. •Surface tones are frequently mistaken by new MUA’s as the undertone. •If the skin’s surface or overtones are incorrectly identified as the undertone, the foundation selection (and concealer) will be incorrect and unflattering. •Analogous colors are those that are touching one another, are usually three colors with one predominant color, and are on the same side of the color. When well done, an analogous color scheme presents a seamless color flow. •Split Complementary colors include a primary color and then one of two colors next to the direct opposite. •Monochromatic color scheme is one in which only one true hue is used, and is accompanied only by tones (shades of grey). The item in color then becomes the focal point. Nature – colors appearing in nature often are inexplicably beautiful and provide inspiration. •Color Theory is also important when choosing accent points. •The makeup artist’s selection will determine whether the look will be neutral, or will “pop” with color. •Neutral accent points are created when staying within the same temperature as the skin undertone. •Textures, which include shimmer, will create more drama, even for the neutral palette. PHOTOS FROM OUR RECENT COLOR THEORY CLASS AT IBS - NYC! Make Up First, LLC is the owner of this document, which cannot be copied or otherwise reproduced without the permission of the owner. WE'RE MAD ABOUT MARCH'S NEW PRODUCTS!